To whom it may concern: I am writing this letter to express my dissatisfaction with my 2001 Toyota Corolla. I purchased this vehicle as a used car in 2005 while it was still under it's 5 year, 50,000 mile warranty. This was my second Toyota vehicle that I have owned. I purchased a new 2002 Toyota Sienna minivan in November 2002. When purchased my 2001 Toyota Corolla I thought it would be a dependable and reliable car for my son as he went away to college. I felt very sure the car would last him for his 4 year college career - given all the good things I had heard about Toyota products. Many Toyota owners have told me of their cars that they have driven 120, 150, 180 thousand miles - with no problems. I thought I had nothing to worry about. Boy was I wrong! The warranty expired on my 2001 Toyota Corolla sometime in 2006. Recently I noticed a 'ticking' sound in the engine. I checked the oil and it was slightly low. I did a complete oil change including filter and the 'ticking' stopped. Three months later the ticking was back - and getting louder. 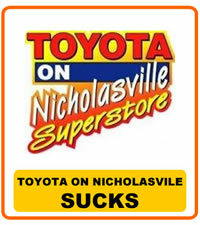 That is why I took the vehicle to Toyota on Nicholasville. I was shocked when they told me the next day that my engine had a "spun bearing" and that it was a "non-serviceable repair" - the engine would have to be replaced! Needless to say I'm stunned. The car that I was sure would be trouble free for many years needs a new engine - a $4,200.00 repair that, with a son in college, I cannot afford. I cannot believe my Toyota has a blown engine with only 54,000 miles! In October 2007 I received a notice from Toyota Motor Manufacturing that my other Toyota vehicle, 2002 Sienna minivan, was also part of a nationwide recall. It seems that the engine is susceptible to "oil gelling" (sludge) buildup. I took my minivan in to be evaluated and found out that it's engine was also damaged beyond repair - it would have to be replaced too. But since the engine in this vehicle was part of the nationwide oil gelling settlement, the repair was covered. This means that BOTH of my Toyota vehicles - each with LESS than 55,000 miles - have to have their engines replaced! As my 2001 Corolla sits idle in my driveway (waiting for me to find $5,000.00 to repair it) I began researching on the web why a "spun bearing" on a Toyota vehicle is a 'non-serviceable' repair. As someone that has worked on cars and motors all my life this makes no sense to me. I eventually came across Toyota's "oil gel settlement agreement" at www.oilgelsettlement.com. I think it's very interesting that a 2001 4 cylinder Camry and 2001 4 cylinder Solara have had their warranties extended to 8 years, 80,000 miles. But a 2001 4 cylinder Corolla? No, they are fine - Yeah, right. I also think it's interesting that, judging from the years of the models in the settlement, it took Toyota Motor Manufacturing almost 10 years to even acknowledge there was a problem. What this tells me is that Toyota Motor Manufacturing is only interested in making a buck. You may "talk the talk" that you value your customers being "completely satisfied" but you sure don't "walk the walk". Needless to say I have lost all confidence in your products. In my lifetime I have owned Fords, Pontiacs, Buicks, Chevrolet, GMC, and Dodge vehicles. Each of these vehicles had over 100,000 miles on then when I traded them in. None of these vehicles ever had to have the motor replaced - not a one of them. How ironic that BOTH of my Toyota vehicles have had to have their engines replaced and BOTH of them happened in the past 6 months and BOTH of them have less than 55,000 miles on them. No wonder Toyota lost their "highly recommended" status from Consumer Reports recently. With the kind of track record you have with me - it's easy to see why. I don't suspect I'll ever hear anything back from this letter. It's ironic that nobody from Toyota Motor Manufacturing has asked what they can do to ensure I am "Completely Satisfied" with my 2001 Corolla experience. It's interesting that those all important questions just don't get asked when you go from "potential purchase" customer to a "needs service" customer. Toyota Response: Response (Renee Toussaint) 01/22/2008 11:32 AM Mr. Adkins, We are sorry to hear of the concerns with the engines of your 2001 Corolla and 2002 Sienna, and apologize these components of the vehicle did not meet your expectations. Your comments have been documented at our National Headquarters, where they remain available for review from the appropriate departments. It is through communications such as yours that we are able to monitor and improve upon the quality of our products and services. If we can be of further assistance, please feel free to contact us. Your email has been documented under file #200801171142. Additional Comments: Customer response to TMM: First of all characterizing the ENGINE of a vehicle as a "component" really makes my complaint seem frivolous. Headlights are a "component" of a vehicle. The ENGINE is the heart and soul. Without an ENGINE my 2001 Corolla has essentially been turned into a 1 ton paper weight. Secondly, you mention that these components of the vehicle did not meet my expectations. What about Toyota Motor Manufacturing's expectations? Do you expect the ENGINES in your vehicles to fail at 54,000 miles or less? Are you "completely satisfied" if the ENGINE lasts only 54,000 miles and no further? Third, the piston rod bearings are internal ENGINE parts that normally NEVER require service. No owner has control over these parts. It's not like it's a part that you can easily inspect and replace it before real damage is done. Once they go bad it's all over. The fact that these parts are going bad at all should be setting off alarms in someone's mind. If it's not then you have bigger problems to come. One owner complaining is like being one molecule on the tip of the iceberg. Finally, my 1998 GMC pickup is now 10 years old and counting. It will be time to replace it in the next 2 - 3 years. I looked at some Tundra pickup truck recently. But after all this hit the fan, there is no way I could ever consider purchasing a vehicle from any manufacturer whose ENGINES can't make it past 55,000 miles. More importantly, when the manufacturer refuses to acknowledge the problem is one that no owner has any control over - well that blows whatever trust the consumer had remaining in you all to pieces. When that's gone you never get it back. Toyota Motor Manufacturing's Response: Response (Quentin Holmes) 02/05/2008 09:16 AM Mr. Adkins, We apologize you are not satisfied with our previous responses. We have already advised of Toyota position in this matter. Our review of the case indicates that all of Toyota's case-handling guidelines have been followed. If you would like to pursue this matter further, we recommend pursuing the issue outside of Toyota Motor Sales, U.S.A., Inc.